My Daily Art Display today features two celebrated men, one the American artist, Benjamin West and the other his English sitter, the naturalist and botanist Sir Joseph Banks. Benjamin West was born in Springfield Pennsylvania in 1738. He came from a large family, being the tenth child. His father was an innkeeper and ran different inns during Benjamin’s early life. Being one of such a large family he had to look after himself a lot of the time, had little formal education and as far as his art was concerned he told his biographer, John Galt, that he was taught how to make paint by the native Indians. During his teenage years he began to paint, mainly portraits. The provost of the College of Philadelphia, Doctor William Smith saw one of his works and was so impressed, he offered the twenty year old West an education which up to then had been sadly lacking but maybe more importantly he offered West the chance to meet members of the affluent society of Pennsylvania and in some cases, ones with political connections. In 1760 these newly-found connections were to prove fortuitous as with the help of financial support from William Allen, a very wealthy merchant and mayor of Philadelphia, he travelled to Italy where he spent time copying the works of the Italian Masters such as Titian and Raphael. Three years later he moved from Italy to England where he established himself as a portrait painter. His works were well received and he soon built up a rich cliental including the prestigious patronage of the monarch, King George III, who appointed West the court’s historical painter. He retained the monarch’s patronage until the turn of the century. Whilst in England he met the great English portraitist, Sir Joshua Reynolds, and together, with the help of the monarch, founded the Royal Academy of Arts in 1768. Reynolds was made the inaugural president and West became the second president of the Academy in 1792, a position he held until 1802. Four years later he became Academy president again and retained that position until his death in 1820 aged 82. 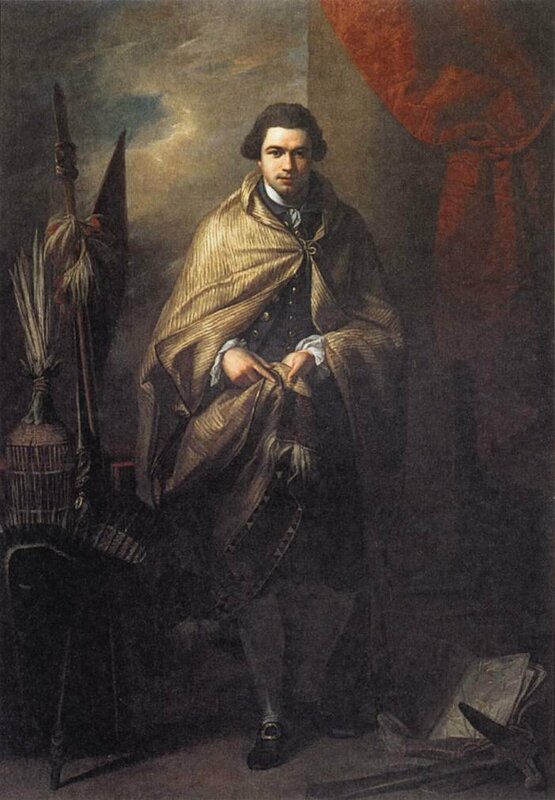 The sitter for today’s portrait was Sir Joseph Banks. Born in 1773 in London, Banks was to become the outstanding botanist of his generation. The son of a Lincolnshire country squire and Member of Parliament, he unlike Benjamin West, received the best education possible passing through the finest educational establishments such as Eton, Harrow and Christ College, Oxford. On the death of his father, Joseph Banks inherited the family estate of Revesby Abbey in Lincolnshire. He had always retained his interest in science and botany and soon he began to move in the top scientific circles of London. In 1776 he became a member of the Royal Society of London for Improving Natural Knowledge, better known simply as the Royal Society. He was to hold the position of president of the Society from 1778 until his death. He became a scientific adviser to King George III and through this managed to persuade the monarch to fund expeditions to the “new territories”. In 1768 Banks was made the leading scientist on Captain James Cook’s first expedition which lasted three years, journeying to the southern hemisphere on HMS Endeavour. On his return home from this epic voyage he was received by the public as a “returning hero” and many portraits were made of the “man of the moment” including one by Reynolds and one by today’s featured artist. 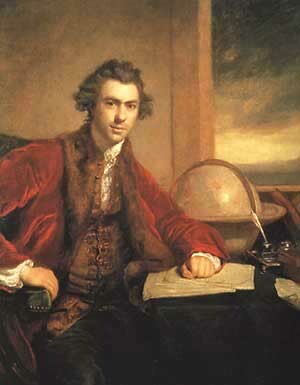 My Daily Art Display’s featured painting is the portrait painted of our hero by Benjamin West in 1773, simply entitled, Sir Joseph Banks. His depiction of Banks differed somewhat from the Reynold’s portrait, which was completed the same year. In Reynolds’ portrait we see the well-groomed and charming explorer and botanist smiling at us. He is completely at ease, sitting forward in his armchair, with his arm resting on a table strewn with pages of a letter, quill pen and ink stand and a freestanding globe. Benjamin West’s work is a full length portrait of Banks standing amongst a selection of artefacts that the explorer had brought back home. He is wrapped in a Tahitian cape and by him is a native headdress, a paddle from a canoe and a carved fighting staff. If we look down at his feet we can a Polynesian adze, which was a tool used for carving and smoothing wood and by it are pages of a notebook which was a reference to the myriad of notes Banks made during his expedition with regards to all the flora and fauna he had come across during the three-year journey of discovery around the South Pacific territories. The painting with its accoutrements even has a hint of the American Wild West, which of course the artist, West, would have seen in paintings back home. There is also a classical element to this picture with its column and tied-back curtain in the background. West may have picked up this type of detail when he was studying works of art during his Italian sojourn. So there you have it, two men of completely differing backgrounds, upbringing and education, Benjamin West the artist and Joseph Banks the explorer, both of whom went on to head up prestigious London societies, and were connected through this painting and their dealings with King George III of England.